Hi everybody, we’re doing a study about people’s attitudes and behaviours to do with bees and pollinators. If you have 10-15 minutes spare, it would be great to have your views! By participating, you can enter a draw to win a £50 Amazon gift voucher and opt to receive a copy of the study’s findings. All views are very welcome, no matter your level of knowledge or interest. And if you can help us by sharing and telling others, that would be very much appreciated! This year we are returning to Penryn campus for our popular Bee Health Day at the kind invitation of Professor Juliet Osborne. The event was last held there in 2015 and was a great success. The event is organised by CBKA, WCBKA, APHA and also sponsored by BDI. Presentations and workshops will be delivered by Bee Inspectors. Practical sessions will take place at either the campus apiary or an apiary close by. In order to help cover costs, we are making a small nominal charge of £5 per person. To reserve a place please e-mail Mike White on mikewaterland@live.co.uk if you are a member of CBKA. If at all possible please BACS your payment to CBKA Account No: 00007630 sort code: 40-52-40 with the reference “Bee Health Day”. 2. Please remember to bring your freshly laundered bee suits, clean wellies boots/gloves, to be worn for the practical apiary disease inspection session. 3. Please be prepared to car share to the nearby apiary if we are not able to use the campus apiary. On Saturday May 18th 2019 we shall be celebrating 100 years of beekeeping in Cornwall from the re-establishment of the CBKA in 1919. Venue: St Erme Village Hall near Trispen just off the A30. 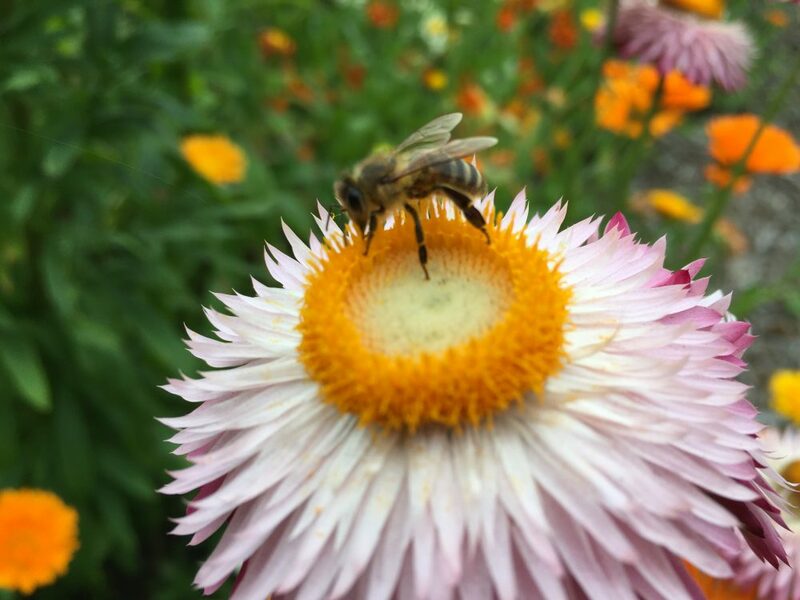 Regional Bee Inspector’s report for 2018 by Simon Jones, Regional Bee Inspector for South West England (Simon covers Avon, Somerset, Devon, Cornwall and Scilly Isles). In his report Simon talks about the Asian hornet, varroa, foul brood outbreaks and Bee Health Days. Back in April the Callington Lions Club contacted us to say that they were proposing to rearrange the town hall layout this year as they wanted to utilise the space better for their activities and entertainment, therefore our honey show area would not be in the main hall but expand sideways into the lounge area. After a visit to the hall we thought we would be able to accommodate the show in the rooms though the sales table and display stands would remain in the hall itself. So we assembled on 2 October perhaps not being at all certain if the arrangements would be suitable. However, after several attempts the tables were finally in position covered by their green cloths, the cups and plaques were on display on a small side table and we could start taking entries for the show. There was a steady stream of exhibits brought in by their owners and by 6.30pm the tables were nicely filled with more expected the following morning. The observation hive was in place and in the main hall the display boards with posters and photographs had been erected as had the sales table with honey and other hive products put out for sale. We all arrived quite early on the fair day and the additional show entries came in to take their places on the tables. The judges and stewards had also arrived. We were delighted that Peter Lewis from Yorkshire, the judge in 2016, and Christine Walters from North Hill, the cookery judge of last year had both kindly agreed to come again, so at 9.30am they and stewards Rosemarie Lane and Ross Hanley were ready to begin their scrutiny. It is to be expected at the Honey Fair that judging will be interrupted on occasions during the day by the media wanting to take photographs and interview the judges and this year was no exception. It took a great deal of deliberation throughout the morning but eventually all the results were known, the prize cards written and placed with the winning exhibits on the glass display stands. There were 116 entries altogether this year, slightly down on last year though the honey classes had a few more as it was a better season for honey production. The judges left some written comments to explain why some exhibits had not been awarded a place. In particular, Peter said more attention should be given to cleanliness of jars and lids, also the state of the top of the honey, some had been entered in the wrong class, some wax exhibits were either old or had been overheated to produce a dark colour and some wine bottles did not have the correct seal. So it is important to read, understand and follow the rules. A most popular attraction for the public was of course the observation hive with bees kindly supplied by Sue Malcolm. Chris Boughton was on hand to to explain what the bees were doing and Henry Kendall, CBKA Chairman, also spent time talking about the bees to several groups of schoolchildren who visited at times during the day. The hive had been sited just inside the entrance to the suite of rooms which led to a bit of congestion at times so a rearrangement may be necessary next year. Another attraction that did extremely well was the candle rolling, introduced for the first time this year, which had been organised by Mary Hardman. Many of people were surprised that it was such a simple method. A lot of interest was also taken in the piece of comb Sue had brought over. There was a good mix of candle rolling volunteers of all ages and a total for 33 candles were taken away. All 15 kits were sold and, with the benefit of hindsight, Mary thought she should have had more in stock. This is obviously a display that could be expanded next year. Sales of honey and wax products were rather slow but picked up later in the day though not a great deal of honey had been sent for sale and the table was topped up with honey from Nine Maidens Mead brought in by Carole Allen. However, at the end of the day the income came to just over £1100. There was a separate board with posters and information about the Asian hornet which generated a lot of interest and Sue Hoult took time to explain to the public why this insect is regarded as such a threat to honeybees. A surprise came in the afternoon when a presenter and cameraman from ITN arrived in the rooms and CBKA President Mary Trace agreed to be interviewed. It seemed that rehearsals were needed first to decide exactly what questions were to be asked and what was to be filmed. Mary showed them round the show itself before finally going “live” answering the questions and enlarging on the danger of the Asian hornet not just to honeybees but all pollinators. They thanked Mary afterwards and it’s understood a short report of the filming was shown the same evening. The weather on the previous day had been rather mixed though it was better on the day of the Fair. It’s difficult to estimate numbers but it seemed that not as many people came through the hall into the show area this year to look at the exhibits. Of necessity the layout had to be restricted because of the size and shape of the rooms, a point which needs to be addressed next year with better signage to direct the public into the show area. There was also some space at the back of the main hall which could be utilised for further display or more hands-on activities. Towards the end of the afternoon President Mary assisted the Lions Club Chairman with the presentation of the Cups which had been taken onto the stage in the main hall where members of the public were still eating their cream teas. It was disappointing that two could not be awarded, one of which would have been to the best young Person as there were no entries and though there were several entries of Granulated Honey none were judged to be worthy of a First Prize. Congratulations go to Callington Childminders for their entry of drawings of bees which had a First Prize. Special thanks must go to judges Peter and Christine. Many thanks also must go to all the helpers: Chris Boughton for collecting and returning the display equipment, Henry Kendall for coming to help on the day, Rosemarie and Ross for stewarding, Miggy Singh for helping with the admin work of the show and also Mark Hoult, Peter and Linda Hunkin, Michael Pickles, Velven Harding and Geoff Hardman. Without all of them there could be no honey show or CBKA presence. Judge Peter has left some comments and suggestions to be considered and if the show has to remain in the side rooms next year it is obvious that some changes will be needed for its future staging. All these will be discussed at the review meeting. Although it’s a long day it is always enjoyable and we hope to see everyone again next year. Our first talk of our annual joint Cornwall Beekeepers Association & West Cornwall Beekeepers Association Bit of a Do day this September was given by bee farmer Dan Basterfield and was all about honey bee dances and ‘The dance language controversy’. Dan grew up with beekeeping around him and now helps to run the family beekeeping business in Devon, expanding the business and building a brand new honey farm. He is an active member of the Bee Farmers Association, was trustee and Chairman of the International Bee Research Association, is a BBKA Master Beekeepers and Examiner; and holds the National Diploma in Beekeeping. He runs 120 – 140 double brood Modified Commercial hives, migrating between various farm crops in East Devon, and raises queens for prolific, productive and healthy qualities. Outside the beekeeping season, Dan undertakes teaching for the BBKA and NDB. What is the dance language controversy? Dan began by explaining that he was surprised to hear honey bee expert Tom Seeley make a casual comment along the lines of: ‘Of course, there’s really only one honey bee dance’. The standard information given by beekeeping books is usually that there’s at least two or three: the direction-less round dance, saying ‘go out and look for it’ for forage within 15m of the hive; sometimes included is the transition dance, for food between 15-100m away; and the famous waggle dance, giving directions for food over 100m away. Dan decided to investigate Tom’s comment further – in fact, his talk took us all the way back to 1744! I love those old beekeeping quotes. Dan used this quote to explain that we have gained an ever better – but still imperfect – view of the dances since then. He said that what he loves about bees is that the deeper you dig, the more there is to look at, the more little tangents they send you off on. Karl von Frisch won his Nobel prize for decoding the dance language of bees. Just two years into his research career, in 1914 the young von Frisch published a paper demonstrating that bees could see in colour, through an elegant experiment that trained bees to go to syrup on a blue square. By 1923 he had produced a paper which described ’round’ and ‘wagtail’ dances. And in 1946 he published the book “Die Tänze der Bienen” (The dances of the honey bee), which described two dances, round and waggle. At the time it was a quite revolutionary discovery that bees had their own crude language. Other experiments since have reinforced von Frisch’s discovery that the waggle dance indicates the direction of the nectar or pollen in relation to the sun. For instance, if you anaesthetise bees for a couple of hours, when they wake they don’t realise the sun has moved since they observed the dance, so they set off in what would have been the right direction, but arrive at the wrong location! Fascinatingly, there are even regional dialect differences! For instance, French & Italian bees seem to misinterpret the distance when watching each others’ waggle dances. The honey bee dance language debate was led by two scientists called Wenner & Wells between the late 1960s-early 1980s. They had a competing theory: odour finding, supported by experimental data. Stingless bees use buzzing runs to recruit other stingless bees to forage; are honey bees similarly just dancing to encourage other foragers to go out, after which they find the forage by scent? Why do only honey bees do these dances, when no other social insects do? The debate led to experiments being repeated. The end result was that Von Frisch’s theory was generally agreed as correct, but how odour attracts foragers became more clearly understood. Dan ran through some famous names who turn up in the big honey bee dance language studies. In the 1980s-1990s the round dance was redefined by researchers including Kirchner, Lindauer & Michelsen as being effective from 1m upwards. Martin Lindauer carried on Von Frisch’s research into honey bee behaviour. Lindauer then in turn developed a working relationship with Tom Seeley, who has now also become a renowned expert on honey bee behaviour. In 1997 Jensen, Michelsen & Lindauer slowed down videos of honey bee round dance and showed a little waggle – there is a ‘waggle phase’ present in round dances. And in 2008 the idea that there are different dances was challenged by Gardner, Seely & Calderone in the paper ‘Do honey bees have two discrete dances to advertise food sources?‘. They concluded that the round and waggle dance are really two ends of the same continuum, both containing information about distance and direction, with no clear switch between the two. They are just variants of the same recruitment dance. In 2012, further experimental data was published by Griffin, Smith and Seeley: Do honeybees use the directional information in round dances to find nearby food sources? They verified Seeley’s earlier study with new experiments to show that the round dance communicates direction too. They used two feeders, one with a much stronger and therefore more appealing sugar syrup, placed at varying distances under 100m from the hive. They found that most of the bees went to the stronger syrup feeder after observing the round dance. Directional bias in recruitment was found for food sources as close as 5m from the hive. A honey bee forager – had she watched a dance first? There is always more to find out about bees! There was an interesting question from the audience: “Do bees communicate height in the waggle dance?” For instance, in a wood, would the dance communicate if the forage was up in the trees or down on the ground? Don said he didn’t know! He thought von Frisch had done some experiments on this, but couldn’t remember their outcome. We also don’t know how bees communicate finding food above them in the hive, for instance when a feeder is put inside. This seems to lead to general robbing in the area. The Cornwall Beekeepers Association and West Cornwall Beekeepers Association put on a great ‘Bit of a do‘ day of talks and trade stands on Saturday 22 November. Here’s a few photos from the day. The first exhibit as soon as you walked in was an Asian hornet nest and special hornet proof ‘Ultra Full‘ suit made by BBWear. The hornet is on everyone’s minds at the moment as we’ve just had three sightings in Cornwall – two nests have been destroyed in Fowey now and a single hornet sighting confirmed in Liskeard. We are an Asian hornet hotspot! Look closely at the nest in this photo and you can see a couple of little orange heads poking out, these hornets died just before they could hatch. The nest itself is quite remarkable, it’s amazing what insects can create. Like a wasps’ nest it is very fragile and light. There was a lot of discussion about the Asian hornet in the final Q&A session, including the best type of bait to use and whether monitoring traps should be put out. Most of the five panellists (Dan Basterfield, Chris Park, Anne Rowberry, Dr Peter Kennedy and Will Steynor) were in favour of using monitoring traps in spring and checking these daily to remove any beneficial pollinators. Dan Basterfield goes as far as sticking his hand in the trap to let any European hornets climb out on him! Some of the panellists were in favour of using killing traps in the autumn as they believe most of the insects trapped at that time of year will be wasps. Different bait seems to be successful in different areas. Dr. Peter Kennedy, a field ecologist, mentioned that in Jersey protein based baits have not been that successful. There they use a specialist wasp attractant called Suterra. In Spain the hornets seem more attracted to fish based baits – prawns are often used. There has been speculation that the hornets may have reached the island of Majorca on fishing boats. There was also a question about a proposal in the new Agriculture Bill that bee imports should be banned and that all beekeepers should be registered. Dan Basterfield, who is a commercial bee farmer, felt that banning imports would not stop bees being brought in within people’s pockets. Anne Rowberry, a master beekeeper from Avon, was in favour of banning imports, particularly as the small hive beetle is now in Italy, where many of our imported bees come from. One of the panel noted that Jersey has compulsory registration but there are still unregistered beekeepers there. This was the well-deserved winning exhibit from the Gadget competition – a useful stand for all your equipment during inspections. Thanks very much to everyone involved in organising and running the day. We had great refreshments too – delicious pasties and cake. The National Bee Unit confirmed on 4th September that a suspect specimen caught in a beekeeper’s monitoring trap in the Fowey area of South Cornwall is the Asian hornet, Vespa velutina. More information can be found in the Defra press release, Asian hornet identified in Cornwall. Cornwall Beekeepers Association has put together Guidance on creating Asian Hornet Action Teams for the Association’s local beekeeping groups. This includes an ‘Action Flow Chart’ of actions after a suspected sighting by a beekeeper and advice on how to collect a specimen. This is a message to all beekeepers so if you know any who are not registered please alert them too. You will know that the Asian Hornet is confirmed in Cornwall. Be sure that you know what to look for and spread the word. Observe, not just in your own apiaries but also where any pollinating insects are gathering eg ivy flowering. If you can, download the posters from the National Bee Unit and distribute – garden centres, farmers etc. The insect is a real threat to all our pollinators. Nests need to be found before the young queens disperse.